Enjoy Florida at its finest! Second floor condo with newer berber carpeting-clean and spacious! Master Bedroom has huge walk in closet and tiled bathroom with duel sinks and walk in shower. Second bedroom is large and close to second bathroom. All appliances look to be newer and include the washer and dryer combo. This unit shows pride of ownership and looks better than new condition with lots of storage space. Ceramic flooring in main living area with carpeting in the bedrooms and fresh paint are key to this unit. The condo also has a storage unit and a screened lanai with a private view. Upgrades include a new berber carpeting, paint and ceiling fans replaced in 2013 along with solid wood kitchen and bathroom cabinets. 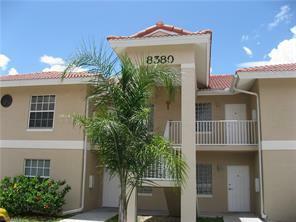 Community is clean and has an awesome pool and Clubhouse with fitness center. Tenant is place until 12/16/2016 at $775 per month. Buyer to pay Association Capital Contribution Fee of $1.000 to The Cove At Six Mile Cypress. Close to shopping, beaches, airport and I-75. Plus a short walk to the Six Mile Cypress Slough where you can enjoy miles of nature preserves and boardwalks!